Hello Friends! Thanks so much for stopping by and visiting my blog, Stock Picks Bob's Advice! As always, please remember that I am an amateur investor, so please consult with your professional investment advisers prior to making any investment decisions based on information on this website. A few moments ago I sold my 82 shares of Johnson Controls at $15.60/share. I purchased these shares at $14.83/share on 11/20/08, so I had a gain of $.77/share or 5.2% since the purchase. This wasn't a sale based on any pre-determined appreciation or loss point. This was simply my own decision that the fundamentals of the stock had changed such that I no longer felt it was an acceptable stock for my own trading portfolio. As I write, JCI is trading at $15.69, down $(1.38) or (8.08)% on the day on the back of the 1st quarter 2009 earnings report released earlier today. JCI announced that it had lost $608 million in the first quarter working out to $(1.02)/share. A year ago, the company reported a profit of $235 million or $.39/share. Johnson controls had pre-announced that it expected a loss, but the level of the loss exceeded the street's expectations. Thomson Reuters analysts had expected a profit of $.01/share removing charges. Even excluding those charges, JCI came in at a loss of $(.14)/share. In addition, the company reduced expectations for the second quarter with guidance now to a second-quarter loss similar to the first quarter. This is below the profit of $.18/share expected by analysts. The decline in sales for this company has involved far more than just the automotive sector, with automotive sales dropping 25%, Power Solutions business (vehicle batteries) declining 32%, and building efficiency sales off 4.8%. I still like Johnson Controls (JCI) for the long haul, but for the time being, I shall be stepping aside from this Wisconsin-based corporation. This sale brings me back to my minimum of five holdings. I shall look to add a new position if any of my remaining five should so indicate. I shall also replace any sales of those five with a new but smaller-sized purchase should any of them reach a sale point. Varian Medical Systems (VAR) "Revisiting a Stock Pick"
The market was very weak today; the Dow dropped 250 points or 2.9% to 8200. The Nasdaq wasn't any stronger, dipping 3.67% or nearly 59 points to 1,489, and the S&P was off 3.35% or 29.17 points to 842.62. However, in the midst of this ongoing bear market, I continue to look for companies which appear to meet most of my own criteria. 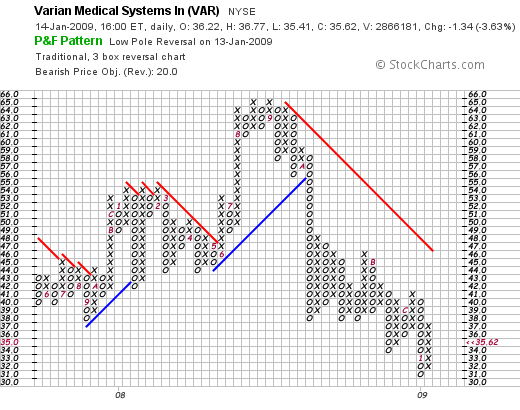 Yesterday Varian (VAR) made an 8+% move higher on an upbeat forecast for fiscal 2009. Unfortunately, with the market weak today, the stock gave back about a half of its gain closing at $35.62, down $1.34 or (3.63)% on the day. This stock however deserves a second look. Varian is definitely an 'old favorite' of mine on this blog. I write this because I first wrote about Varian (VAR) on October 20, 2003, more than five years ago! Two years later, on May 11, 2005, I once again wrote up Varian on Stock Picks. I do not currently own any shares or options on this stock. But I do still like Varian's business and their fundamentals remain impressive. "...and its subsidiaries provide cancer therapy systems worldwide. Its Oncology Systems segment designs, manufactures, sells, and services hardware and software products to treat cancer with radiation, including linear accelerators, brachytherapy afterloaders, treatment simulation and verification equipment, and accessories, as well as information management, treatment planning, and image processing software." "In 2005, 7.6 million people died of cancer out of 58 million deaths worldwide. More than 70% of all cancer deaths occur in low and middle income countries, where resources available for prevention, diagnosis and treatment of cancer are limited or nonexistent. Based on projections, cancer deaths will continue to rise with an estimated 9 million people dying from cancer in 2015, and 11.4 million dying in 2030." Healthcare business, while relatively insulated from economic trends, is also feeling the effects of the economic downturn as this story relates. However, the pain felt in many cyclical businesses is far greater than the effects of the global economic slowdown on health-related businesses and employment. This relative strength in healthcare was reflected in the recent employment report which noted every industry losing jobs "...except education, health care, and govenrment." Which brings me back to Varian Medical Systems (VAR). "While there is unprecedented volatility and uncertainty in this economic climate, the solid net orders growth in the first quarter gives us cautious optimism about the prospects for our businesses in 2009," said Guertin. "Since initiating share repurchase authorizations at the end of fiscal year 2001, the company has spent $1.4 billion to repurchase 36 million shares of common stock at an average price of $40.13 per share." Stock repurchases are helpful in supporting and advancing the price of a company. Let's take a closer look at some numbers behind this company as reported on the Morningstar.com "5-Yr Restated" financials. First of all, we can see a very pretty picture of steady revenue growth from $1.24 billion in 2004 to $2.07 billion in 2008. Earnings have also increased in an uninterrupted fashion from $1.18/share in 2004 to $2.19/share in 2008. At the same time, outstanding shares, as explained above, has been decreasing from 142 million shares in 2004 to 128 million in 2008. Free cash flow, as reported by Morningstar, has been positive and growing with $160 million in 2006 increasing to $291 million in 2008. The balance sheet appears solid with $397 million in cash and $997 million in other current assets. This total of $1,394 million, when compared to the $781.7 million in current liabilities yields a current ratio of 1.78. Varian has a relatively small amount of long-term liabilities reported to be $166.7 million. Reviewing a few "Key Statistics" on Varian from Yahoo, we can see that this stock is a mid cap stock with a market capitalization of $4.43 billion. 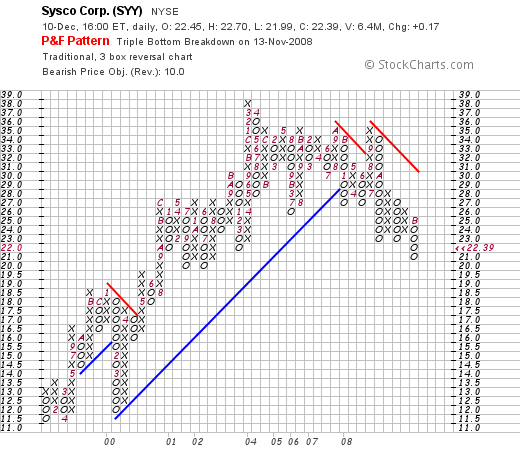 The trailing p/e is a moderate 16.26, but with strong growth expected, the PEG is reported at a very nice 0.87 level. Checking the Fidelity.com eresearch website, we can see that in terms of the Price/Sales ratio, Varian is relatively inexpensive with a Price/Sales (TTM) ratio of 2.24 compared to the industry average of 6.15. The company is also relatively more profitable than its peers with a Return on Equity (TTM) of 31.49% compared to the industry average of 14.24% per Fidelity. Returning to Yahoo, we find that there are 124.25 million shares outstanding with 123.37 million that float. As of December 10, 2008, there were 7.11 million shares out short representing 4.6 trading days of volume (the short ratio), which is a bit more than my own '3 day rule' for significance. We may have seen a bit of a 'squeeze' of the shorts yesterday on the back of the good news announcement. No dividend is paid and the last stock split was a 2:1 split back on August 2, 2004. Here we can see that after hitting a 'double-top' in August, 2008, at $65.00, the stock broke down and continues to trade with lower lows and lower intermediate highs to the current level around $35.62. I see little to indicate any technical strength in this chart unfortunately. However, I am not currently prepared to buy shares in Varian (VAR) nor any other new position. The decision to buy a new holding will only result after one of my current holdings hits an appreciation target on the upside. Needless to say in the current market, my holdings are moving in rather the opposite direction! But in the midst of this depressing trading milieu, I continue to remain optimistic long-term and continue to look to identify the quality companies that are able to persistently grow revenue, earnings, free cash flow, and possibly dividends, while maintaining solid balance sheets and reasonable valuation. Except for the weak chart, Varian (VAR) is quite impressive and has easily earned a place in my blog! Satyam (SAY) "Taking Another Look"
Satyam (SAY) is what I would have to call an 'old favorite' of mine. "So what do I think? The stock is certainly showing strong fundamental and technical strength with a superb quarterly report which also raised guidance, a solid Morningstar.com "5-Yr Restated" financials, including growing free cash flow and a solid balance sheet. Valuation-wise, the PEG being just a bit over 1.0 is encouraging. However, the Price/Sales appears very rich at 6.1, way ahead of other stocks in the same business." I was sold on the numbers. And yet were the numbers actually safe to believe? 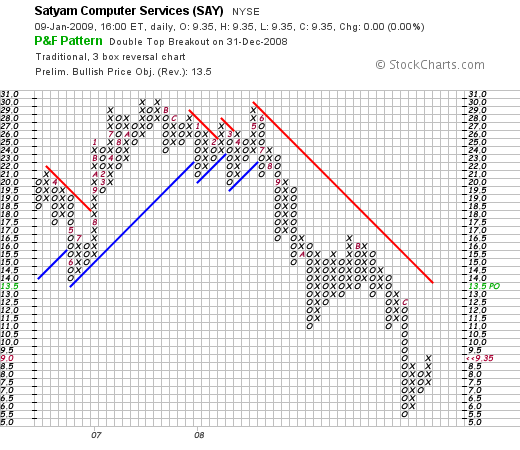 On April 19, 2008, I "revisited" Satyam on this blog. The 'numbers' once again caught my attention. "The latest quarter was strong and the company raised guidance. The longer-term view is equally impressive with steady revenue growth, earnings growth, and even dividend growth! Outstanding shares have been relatively quite stable and free cash flow is positive. The balance sheet is solid. Valuation-wise, the company sells at a modest p/e with a great PEG ratio reported. Price/Sales is a bit rich but the company is more profitable than its peers as judged by the Return on Equity and Return on Assets ratios. Finally, the chart looks satisfactory with the price undergoing a recent period of price consolidation and with the chart on the verge of 'breaking out' assuming the rest of the market holds up. In other words this is my kind of stock! Now, if only I had been able to hang on to the shares I have owned in the past." No I do not currently own any shares. In the past, I actually purchased shares in April, 2007, only to sell the same shares in August, 2007, with an (8.15)% loss. I wrote about this trade here. If you have been following the financial news, you will be aware of what has been called India's Enron. The 'cooking of the books' that has led to the collapse of Satyam stock and the arrest of B. Ramalinga Raju, Satyam's former Chairman and founder and his brother B. Rama Rajku, a co-founder of the company. If we examine a 'point & figure' chart on Satyam (SAY), we can see that the breakdown in the stock price actually became apparent in July, 2008. For me, my own discipline of limiting losses saved me from even larger financial damage. This once again shows the potential problems of depending purely on 'value' and ignoring the decline in stock prices that may well be indicating greater problems, either with the equity itself or the market as a whole. I was fooled along with other investors in Satyam (SAY). I read the basic news from Yahoo, saw the Morningstar reports and like what I read. I even bought shares in the stock and got 'stopped-out' with a loss. Perhaps the most important lesson is to be aware that there is a leap of faith with every investment we make. That we need to not fall in love with any holding, pull the plug when the stock price deteriorates regardless of the news or numbers, and diversify adequately to protect ourselves from implosions of this sort that may well be totally unexpected. I continue to learn from every investment and every blog entry that I make. As always, as I write over and over, I must let you know that I am an amateur. Please do check with your professional advisers who may also be unable to know what nobody has the power of knowing---that from time to time there are those who report information that they know is incorrect. I trust that what I read from the best sources is true and reliable. Reality fails us from time to time in meeting even these basic expectations. I have been extremely quiet on this blog. For that I apologize to all of my readers. However, there are times for activity and times for simply sitting quietly. I believe that we are in that latter period. Certainly there is no uniform agreement on the proposed economic stimulus of President-elect Obama. Personally, I believe that government does indeed have a role in a fiscal stimulus of the beleaguered economy. Unfortunately, during the past eight years of relative economic stability, the current Administration has followed a 'supply-side' economic theory that utilized tax cuts without regards to expenditures to keep the economy moving. With this policy, the government changed a surplus to a massive deficit. Now that we need to utilize deficits to stimulate the economy, we find ourselves already dealing with deficits that have been incurred in times of relative economic health. We likely need to push federal spending to get the economic recovery we all desire in spite of past deficits. In the meantime, I continue to implement my strategy of monitoring my own holdings, using them as the indicators for future purchases and sales and the shifting between equities and cash. I also continue to monitor the top % gainers list--I should point out that rarely do I find stocks that appear to fit my own strategy, but yesterday did note that Chase (CCF) an old favorite of mine, and yet a stock that I do not own, made a nice move higher. Otherwise, I am waiting patiently with much of my portfolio in cash and with my 6 positions being monitored closely. I shall continue to keep you posted. My Trading Portfolio "An End of the Year Analysis"
Hello Friends! Thanks so much for stopping by and visiting my blog, Stock Picks Bob's Advice! As always, pleased remember to consult with your professional investment advisers before making any investment decisions based on information on this website. Before I get any further, I would like to wish all of my friends and readers a very Happy and Healthy 2009. With the New Year upon us already, I didn't want to let a moment pass before getting my year-end status online. I last reviewed my holdings November 30, 2008 As I often explain here, I write about many different stocks as well as the stocks I actually own in my 'trading account'. As part of my effort to be as transparent as possible I try also on a regular basis to offer all of you a summary of how my own portfolio is doing. The following list shows my holdings as of December 31, 2008, with the names of the stocks, their symbols, the number of shares held, date of purchase, the cost basis, latest price (12/31/08), and the % gain (or loss). Currently I have $18,487.43 in a Fidelity Municipal Money Market account. This is in addition to my $18,030.48 in equities described above. The account as of 12/31/08 had a total value of $36,517.91. As of 12/31/08, my portfolio had $2,520.32 in unrealized gains. For 2008, my account had a net of $42.76 of realized gains after accounting for the $(9,246.00) in net realized short-term losses and $9,288.76 in net long-term gains. I continue to regularly add $200/month to the account which goes into the money market fund. In 2008 I received $160.75 in ordingary dividends, $.44 in capital gain distributions as well as $118.33 in tax-exempt income for a total of $279.52 in income. Balancing this was the total of $(244.79) in margin interest paid during 2008. Overall 2008 was essentially a wash for me in terms of realized activity. However, what suffered the most was the loss of so much of my unrealized gains on my holdings. Thus, my account value dipped during the year as it did with so many investors. Thanks for taking the time to visit my blog and I look forward to many more entries going into 2009 and the future. Apogee Enterprises (APOG) "Revisiting a Stock Pick"
Many of my recent entries have been about my trades---some successful and some not----and I haven't been writing quite as much about the kind of stocks that I refer to as my vocabulary of investable companies. These are companies that meet my fairly well-accepted criteria of consistent revenue and earnings growth, stable shares, positive free cash flow, and healthy balance sheet. It was a relief yesterday when I saw an 'old favorite' of mine, Apogee Enterprises (APOG) make the list of top % gainers. While I do not limit myself at this time to selecting stocks off these gainers lists, I do find them helpful in identifying companies that may have enough momentum to exhibit price appreciation in a prolonged fashion. I first discussed Apogee on this blog back on September 20, 2007, when the stock was trading at $25.76. As I write this entry, Apogee is trading at $10.10, up $.56 or 5.87% on the day. However, the stock has declined markedly since my entry, actually down $(15.66) or (60.8)% since posting. Not exactly a stellar pick from last year, is it? I do not own any shares or options of this company. Apogee is heavily involved in architectural glass, and associated products and services. It does also have some exposure to the picture framing market and optical display business. However, the construction slump that we have been experiencing in the United States has brought down shares of construction-related stocks like Apogee. I would like to take you through some of the things about this company that I still find attractive even though the nature of the business itself, being associated with the building industry, concerns me. First of all, the company jumped yesterday after they announced 3rd quarter 2009 results and maintained guidance on the rest of the year. Revenues for the quarter came in at $240.4 million, up 14% from the prior year. Earnings from continuing operations were $.63/share, up from $.26/share. Net earnings, including discontinued operations, came in at $.63/share, up from $.38/share last year. If we review the Morningstar.com "5-Yr Restated" financials on APOG, we can see the picture of steady revenue growth from $490.8 million in 2004 to $881.8 million in 2008 and $937.7 million in the trailing twelve months (TTM). Earnings have similarly increased during this period from a loss of $(.20)/share in 2004 to $1.67/share in 2008 and a dip to $1.66/share in the TTM. The company also pays a dividend and has been increasing it annually from $.24/share in 2004 to $.28/share in 2008 and $.30/share in the TTM. Outstanding shares have been very stable with 28 million shares reported by Morningstar in 2004, and 29 million in the TTM. Free cash flow has been positive and generally increasing with $5 million in 2006 growing to $31 million in 2008 and only dipping slightly to $23 million in the TTM. The balance sheet appears adequate with $6 million in cash and $244 million in other current assets resulting in a current ratio of 1.46. Currently, the company pays a small but increasing dividend but with the decrease in the stock price this works out to an attractive 3.6% yield. The last stock split was back on February 18, 1997, when the company split its stock 2:1. 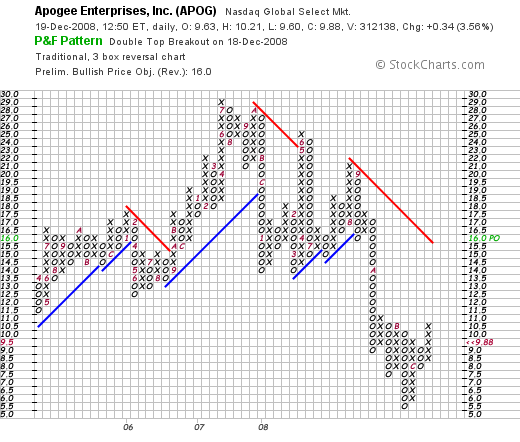 Looking at the point & figure chart on APOG from StockCharts.com, we can see that the stock price peaked back in July, 2007, at $29. The stock experienced growing weakness through August, 2008, when it managed to reach a level of $21, then broke down completely in September of this year, dipping as low as $5.50/share. The stock appears to be showing some recent strength but it would need to trade above $15.50, at least per this chart, to suggest some technical evidence of breaking-out above resistance. Two additional stories from Yahoo also suggest an effort by management to continue to support the price of this stock. First of all, was this story from October 8, 2008, when the company announced an increased dividend, and this story also from October 8, 2008, when the company announced an increase in its share repurchase authorization. Thus, I find myself once again writing about this small Minneapolis-based firm. I enjoy writing up stocks from the Midwest regardless of how many inches of snow we may have received last night! But seriously, even though I do not own any shares, they reported a great quarter in the face of a dismal construction environment, have a terrific longer-term track record of increasing revenue, earnings, and even their dividend, and have compelling valuation numbers. On the downside is the ever-present reality of the awful building and home-construction market. In addition, I have been a bit wary of stocks trading at just-above $10, and I have had problems as well with these very small-cap companies. But this may well represent a good opportunity in this stock, and it deserves another mention on my blog! Thanks so much for stopping by and visiting! If you have any comments or questions, please feel free to leave them right here on the website or email me at bobsadviceforstocks@lycos.com.